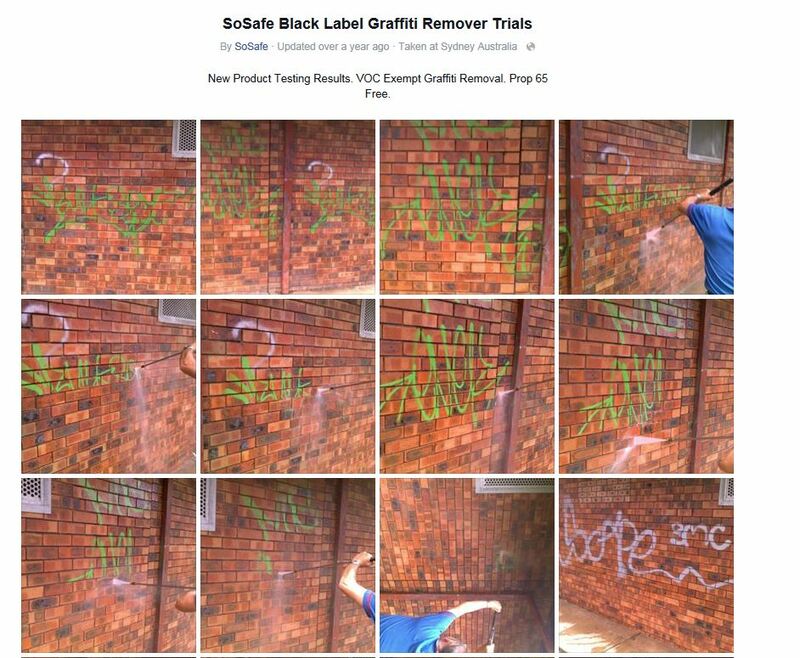 Step-by-step instructions for how to clean graffiti spray paint from brick wall using SoSafe Black Label Graffiti Remover, the low VOC / VOC exempt graffiti remover for brick and concrete. SoSafe Black Label Graffiti Remover is a Low VOC / VOC exempt graffiti remover. It contains no Prop 65 chemicals. SoSafe Black Label Graffiti Remover is ideal for cleaning tough surfaces such as brick and concrete. Use pressure washer for best results. Step 1: Spray, pour, or brush SoSafe Black Label Graffiti Remover onto graffiti tag. Step 2: Allow a moderate dwell time of approximately 10 minutes. Note: Longer or shorter dwell time is possible depending on conditions. If spray paint is highly saturated, the brick is highly porous or the temperature is cool or cold, allow for a longer dwell time. Additional SoSafe Black Label Graffiti Remover can be added to graffiti tag during dwell time, especially in areas of high saturation or where initial application was light. SoSafe Black Label Graffiti Remover must have contact time with all paint. Any missed spots will remain after pressure wash. Step 3: Pressure wash using a wide, fan tip pressure washing nozzle using slow, even passes. Take care not to pass too close to limestone surface to prevent any damage from pressure. Either a green 25 degree nozzle or a yellow 15 degree nozzle diffuses the pressure so that if the pressure washer passes to close to the stone, no damage will result. While the pressure wash is an important role in rinsing the paint and graffiti remover from the surface, the SoSafe Graffiti Removers are doing the majority of the work in breaking the bond between the paint and the brick. Once the paint is soft and buttery, the pressure wash effectively rinses clean the surface. If any spots were missed, or if dwell time was insufficient, process can be repeated.